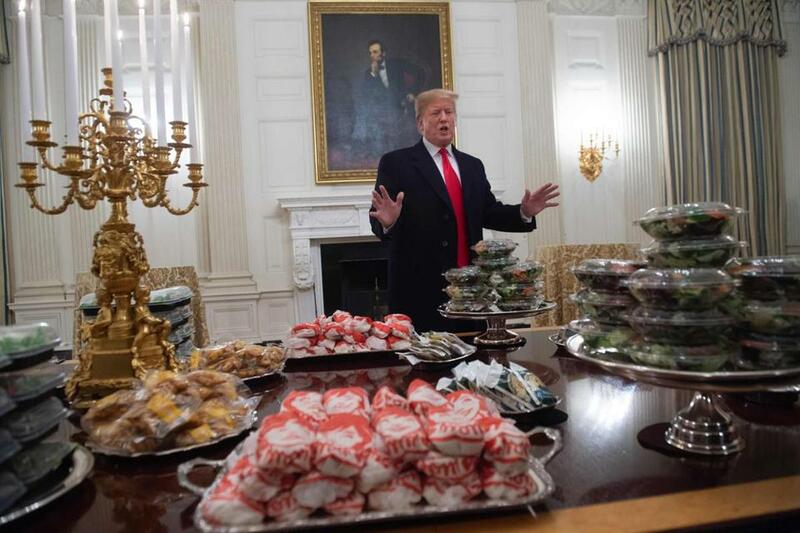 President Trump served fast food to the college football national champion Clemson Tigers in the State Dining Room of the White House on Jan. 14, 2019. Jokes about Donald Trump’s service of fast food to the Clemson football team (ostensibly because of the government shutdown) are almost as stale as the fries were, but here we are, and there they were. But this wouldn’t be New England’s foremost log of essential memes if I didn’t at least mention the equally impressive spread of Photoshop wonders lovingly prepared from the (already unbelievable) photos of what I call the Lost Supper. In other news, Mayor McCheese was just named White House Chief of Staff. Gillette managed to irritate the most sensitive areas of its target demographic when it launched a new ad campaign implicitly aligned with the #MeToo movement, and explicitly targeting toxic masculinity, by calling on men to “say the right thing,” “act the right way,” and, you know, allow women to walk past you without suffering your sterling compliments. Not surprisingly, #NotAllMen took the constructive criticism so smoothly, with furious, totally secure, and increasingly stubbly dudes posting all sorts of theatrical hissy fits, threatening boycotts and posing with guns (for some reason). In response, executives at Crest quickly nixed their forthcoming “Maybe try smiling more” campaign. Elsewhere on the Internet, behold the spectacular mutations of the #10yearchallenge, which originated on Facebook and Instagram as an excuse to post two pictures of yourself and mine for compliments regarding your ostensibly increased hotness. The phenomenon quickly turned into a conspiracy theory about nefarious machine learning techniques, before fracturing off into several sub-memes applying the 10-year gap to everything from unfolding environmental disasters, to Jessica Simpson’s swollen feet, to Mariah Carey’s apparent immunity to time itself. This was all quite a relief to me as I’d assumed the #10yearchallenge was just to last 10 more years.